Conditional play is a feature that allows rules to be set for when content is eligible to be shown within a layout. Conditional play can be set on pages, zones and playlist items, giving you complete control of what content is to be shown and when. You can also add multiple conditional play rules to an item giving even further control. The rules are based on the device that the layout is being displayed on, so the time, date and location settings need to be accurately set on every device registered to your account. When registering a device, if it does not automatically geolocate, you can manually add a device location - this is important as this is the location that will be used for the weather conditions, wind and temperature rules for that device. When would I use conditional play? Used for content within a layout that you want to display during certain times of the day. Select 'Times' as the rule type then simply choose your start and end times. Set items to show on an overnight schedule, by applying the days rule too. Used for content within a layout that you want to display during a specific date range. 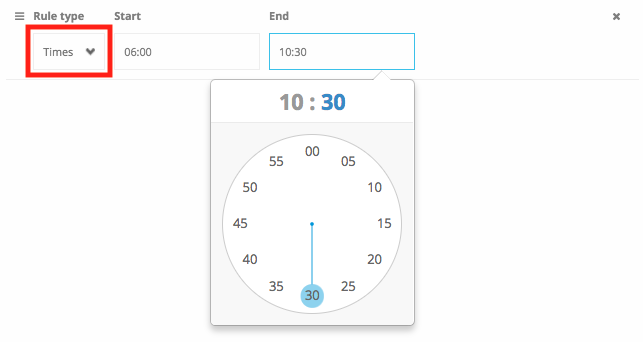 When adding a start and end date, the start will be 00:00 on the specified day and the end will be 23:59 on the specified day. For example, 1st December to 19th December will begin at midnight on the 1st and end at 23:59 on the 19th. Select 'Dates' as the rule type and then choose your start and end dates. A Christmas party reminder running from 1st December to 19th December. Used for content within a layout that you want to display on specific day(s) of the week. Select 'Days' as the rule type, then select the day(s). If you have content playing overnight, you will need to select the 'Include next day if has overnight time rule' option otherwise the item will only show up until midnight. Used for content within a layout that you want to display during certain weather conditions. Select 'Weather condition' as the rule type and choose your condition. Used for content within a layout that you want to display while the weather is between a certain temperature range (either celsius or fahrenheit). Select 'Temperature' as the rule type, then choose unit of degrees and specify your low and high temperatures. An ice cream offer that appears when the temperature exceeds 20°C (low temp). Used for content within a layout that you want to show when the wind is between two units of speed (either MPH or KPH). Select 'Wind' as the rule type, choose the unit of speed and specify your wind speeds. Used for content within a layout that you want to display depending on the connectivity status of your device. Select 'Connectivity' as the rule type then choose the status (online or offline). You can schedule items to show/ hide depending on whether there is/ is not a meeting in progress. You will need to add the room booking plugin, with room booking system, into a zone on the page - conditions are taken from this room booking system. Then add the room booking conditional play to the content you want to schedule. Add the 'Meeting In Progress' option to show a zone with an image of the clients logo, while their meeting is in progress. You can add multiple types of conditions to any item (page, zone or playlist item). The more conditions you set the more specific you are about when you want that item to display. For example if you had a 'Its cold this morning, come in and purchase a coffee' message you could set 'Times' and 'Temperature' conditions to only display that message during the morning whilst the weather is between two specific temperatures. Note: All conditions that have been set must be met for the content to show. How do I add conditional play?